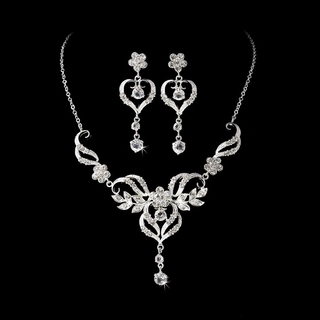 This elegant necklace and earrings set features a swirly silver-plated design adorned with sparkling rhinestones. A subtle heart shape graces the earrings and the center of the necklace, making this piece a romantic addition to any bridal gown or special occasion dress! Size: The necklace measures 14-1/2" long with a 2-1/4" extension. The central drop measures 2-1/2" long. The matching earrings measure 2-1/4" in length.